It’s possible that I may be the only knitter on the east coast that did not go to Rheinback. Work and play schedules just didn’t allow that glorious trip to happen this year so now I get to click on everyone else’s blog and live vicariously through them. The only upside I can think of is that I don’t have the money for yarn at this time and god only knows what kind of debt I would be in if I had gone! But what a goregous weekend they had – I don’t think the weather could have been any better. As for my knitty life – it’s just been that kind of month. Work – workout – knit – wine. I have been such a lurker on everyone’s blogs just clicking and reading then leaving because my time is so limited lately. There is a light at the end of this Lack of Time tunnel and it is coming in the next two weeks. And, let me say THANK YOU to all those who left me birthday comments!! I feel so blessed to have such great readers who didn’t make fun of my chubbs. 😉 Know that it made my day bright! For now I’ll try to get my blogging in as much as I can. There’s so much great knitting going on everywhere! Socktoberfest is alive and kicking and despite the fact that I myself haven’t gotten a sock on the needles I’m queueing up patterns left and right! I also saw another beautiful Tilted Duster which is slowly trying to make it’s way on my needles. Right now that long stream of stockenette is so lovely to this busy woman – no thought required! I am envisioning it in black – a nice classy simple jacket. Only if the weather would get below the 70s would I be craving to knit it more. I also got a new Rebecca mag (34 i think) at my LYS and want to start knitting pattern #22 – Sweater with Lace panels… gosh they really go far with naming don’t they? It’s the sweater on the cover and I’m having a nice peek and daydream love affair with it. It’s much more thought oriented and will have to wait for when I can devote a little more time to her but I’m tagging this one for the last sweater I do this year! 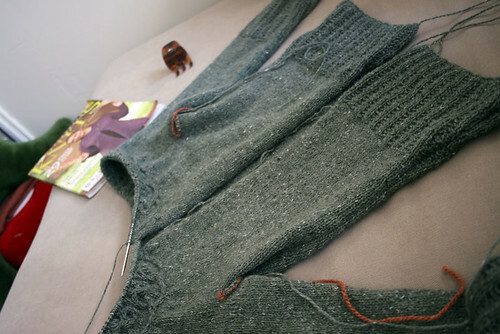 And speaking of sweaters – time for some progress pics of TY! She’s coming along beautifully! I think my sleeves may be a bit too short but we’ll survive. I am trying to finish the cabled part tonight under a very bright lamp. The fun part has really been a "must concentrate or it’s going to get So Fucked up" experience. I did have to rip out a few times just to get it right but it’s oh so purdy! Your Tangled Yoke is looking beauteous! I’m feeling inspired to try one. TY is looking great – almost there! Can’t wait to see what buttons you find….life is crazy here too – seems like time has been squeezed lately and I don’t have the time to do the stuff I used to! 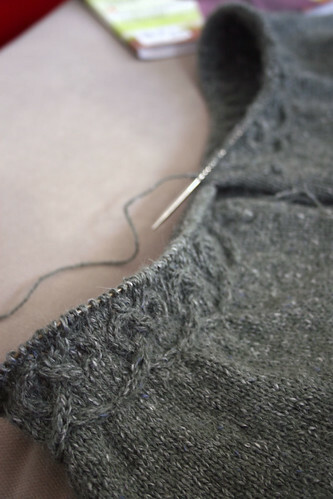 Your Tangled Yoke Cardi is looking fantastic so far!And you’re not the only one who didn’t go to Rhinebeck- I’ve been trying to live vicariously through other people’s blogs as well. I figure I could spend the whole year saving up for a big yarn budget, go next year, and get a massive haul of yarn! Ok, so I didn’t go either. The cardigan looks really great. I think I want to try that one. But then I think everyone wants to try that one! Your TG is awesome. As soon as my thumb feels better, I’m casting on, US3 needles or not! TG is going to be one gorgeous sweater! ‘Love your routine of working out BEFORE knitting. Somehow over the summer knitting moved to the spot before my work out – great for knitting productivity – lousy for the body! I can’t wait to see your fininshed TY! I am checking out all the versions I can find on line to better decide which colour to make mine in! Wow your TY is lovely, love the color esp.! Thanks for the Tilted Duster shout. It really is fast knitting at its finest. This sweater is going to be done lickety-split! It’s a really gorgeous color… hmm, what kind of buttons will you choose? Conservative or funky? M-The sweater looks stunning!! As do you (in it)! Congratulations on another beautiful piece. I have been crazy at school but now I’m gonna be commenting on all over the place!